Valentino Rossi splashed to his sixth pole of the season at Assen today, ahead of Saturday’s MotoGP round. The Honda rider made the most of the two combined sessions as bad weather disrupted normal qualifying. The first session started damp and just as soon as the track began to dry and the times pick up, the heavens opened and drowned anyone’s chances of improving on morning practice. The forecast for tomorrow is more of the same. But the rain was good news for Honda’s rivals. 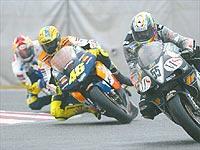 Both Yamaha and Suzuki continued to improve with both Max Biaggi, teammate Carlos Checa and Suzuki’s Kenny Roberts out-qualifying Rossi’s partner Tohru Ukawa. The weather levelled the playing field for the two-strokes: Loris Capirossi takes up fourth spot on the front row, with the other West Honda Pons NSR of Alex Barros right behind him. Britain’s Jeremy McWilliams was ninth.